Some data tables need very little introduction. You may draw your own conclusions, but here are a few of mine. The most popular are two NGOs traditionally considered to be of the liberal left: Greenpeace and Amnesty International. It might be argued that, until relatively recently, all NGOs were largely leftish, so it’s not surprising that the longer-established ones are best known and respected. There may be some truth in this, but the fact they receive very little opposition is striking given that Greenpeace in particular has a record of being very outspoken and skirting close to the edge of the law. Two organisations that are very effective as political campaigners, Immigration Watch and the Taxpayers’ Alliance, have among the lowest public understanding of their mission. The Taxpayers’ Alliance in particular seem to be on major UK news programmes on a weekly basis, yet half the British public don’t know seems to know what they stand for. This strikes me as an important lesson for small organisations that want to have a large impact, but don’t believe they have the resources to earn widespread name recognition. I’m taken aback by the Fathers 4 Justice’s scores. For an organisation associated with superheroes on palace balconies, which has generated a couple of its own splinter organisations (The Real Fathers 4 Justice, New Fathers 4 Justice), its ratings are exceptional. They’re also very consistent across different groups: women score it nearly as highly as men; Guardian readers are only slightly lower than Mail and Telegraph readers. And on those lines, a couple of details about Greenpeace’s scores. While they do particularly well among Labour (79% support) and Lib Dem voters (78%), they don’t score badly among Tory voters (59%). Equally, their scores are very high with Guardian (90%) and Indy readers (84%), but they’re perfectly respectable among Mail (63%) and Telegraph readers (60%) too. Intriguingly, one of the groups who seem least well disposed to them (‘just’ 57% support) are those who are the most positively inclined towards David Cameron. Make of that what you will. This entry was posted on Wednesday, June 15th, 2011 at 23:37	and is filed under Climate Sock, Politics. You can follow any responses to this entry through the RSS 2.0 feed. Both comments and pings are currently closed. Very interesting – be careful of jumping to ‘public understanding’ from support/ don’t know though. Understanding different (albeit connected) issue. You’re right – don’t know could include ‘Having considered their viewpoint, I’m undecided about whether I support them or not’, as well as ‘I don’t know who they are/what they stand for’. I would guess that at least a large part of them would be the latter. In terms of the selection of NGOs, one thing worth thinking about was why the poll was commissioned, and this question’s place in it. I doubt it was because they were particularly interested in what the population as a whole think about these organisations. Instead, I would imagine the poll was set up to produce a segmentation of the population, where they used a series of statistical tools (particularly cluster analysis) to identify a number of groups who share similar characteristics. Given the large size of the total sample, they would have been able to cut the total population into a decent number of groups, and still have useful base sizes. So a question like this would have been used either as one of the drivers of the segmentation (identifying the different groups), or as one of the questions that would have been used to describe the segments that had been created. 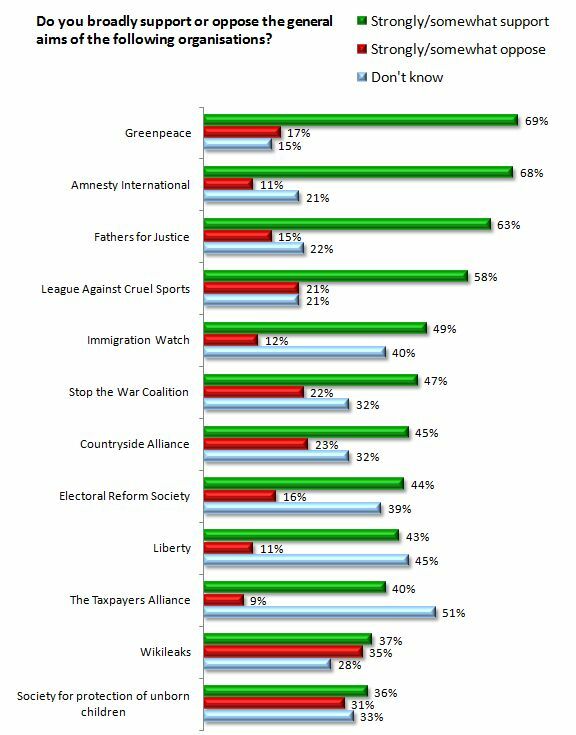 In either case, what’s interesting is whether certain groups have strong attitudes towards particular NGOs, eg does one group hate Greenpeace but love TPA, and vice versa? With this in mind, they seem to have selected a number of NGOs that could be seen to be representative of particular worldviews – rather than going for an exhaustive list. Hi Alex – sadly not a typo on my part. It’s striking how many mistakes/typos crop up in polls (the lack of apostrophe in Taxpayers’ Alliance was another). I hadn’t spotted this one but it’s pretty bad. Of course Immigration is a more loaded word than Migration, so has maybe boosted the ‘support’ score – but then it’s impossible to know the effect of asking about an organisation that doesn’t exist!